SINGAPORE (Oct 25): Most emerging Asian currencies edged up on a stable Chinese yuan on Tuesday, although regional units stayed under pressure as solid US manufacturing data and a Federal Reserve official's comments cemented expectations of December tightening. The yuan started the onshore trading at a six-year low of 6.7787 per dollar, tracking a weak central bank guidance rate, but the Chinese currency turned the depreciation path on corporate dollar selling. The deputy governor of the People's Bank of China said in a newspaper editorial that there is no basis for continuous depreciation of the renminbi and the exchange rate will remain broadly stable. The yuan on Monday recovered some of its losses as large state-owned banks sold dollars in an apparent effort to slow a rapid decline, traders said. A stable yuan helped other emerging Asian currencies such as the Taiwan dollar and the Singapore dollar. Thailand's baht outperformed on bond inflows. Still, expectations of a Fed interest rate increase in December hurt sentiment towards regional currencies. Uncertainties over US elections in November and China's economic recovery also weighed on them. The South Korean won slumped to its weakest level in more than a week as foreign investors sold the country's stocks and bonds. "We are seeing temporary stabilisation in EM Asia FX. But a rebound is unlikely," said Nordea Markets' chief analyst Amy Yuan Zhuang in Singapore. 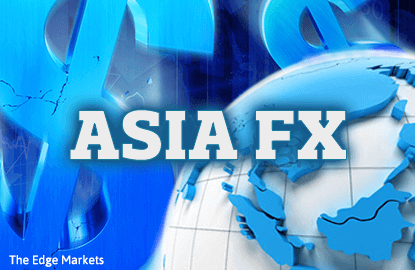 "The Fed policy, US election and China risks will affect Asia. Especially, China risk may not be fully priced in currently in Asian FX due to the latest macro stabilisation," Zhuang said. She said China is not expected to devalue the yuan but the market will nonetheless fear devaluation if the current weakening continues and breaks through 6.8. The US dollar hovered near a nine-month peak against six major currencies as preliminary Markit survey on Monday showed manufacturing activity levels reached a one-year high this month. Chicago Fed President Charles Evans said on Monday the Fed could raise rates three times between now and the end of 2017, so long as inflation expectations and the labour market continue to improve. The baht gained as foreign investors continued to buy Thai bonds, seeing the recent selloff as excessive, given hopes for calm after King Bhumibol Adulyadej, the world's longest-reigning monarch, died earlier this month. Local interbank speculators also covered some of bearish bets on the currency, while foreign currency traders took a breather. The baht gave up some of earlier gains due to a lack of signs that the local equity market started seeing a return of foreign inflows yet. The won lost as much as 0.8% to 1,139.6 per dollar, its weakest since Oct. 17. Offshore funds sold the currency as foreign investors were set to become net sellers in South Korea's main stock exchange after a buying spree over the previous eight consecutive sessions. Foreign investors were also seen extending a selling streak in the domestic bond market. The selling came as data showed South Korea's economic growth is expected to meet the central bank's 2.7% forecast this year with third-quarter growth higher than expected. That underscored expectations that Bank of Korea is more likely to observe than act on monetary policy. The South Korean currency recovered some of the losses on expectations of exporters' month-end demand, while such corporate bids were not that strong, traders said.